President Trump was at his best when he touted the economic accomplishments of his first year in office. The benefits of the Trump tax cuts should be obvious to every American—unless they have gone to graduate school or read the New York Times. It was kind of a delicious moment when Trump pointed out that under his administration black unemployment is at an historic low. The Democrat Congressional Black Caucus: glaring angrily at the President. Because black Democrats don’t care about black unemployment. They are slaves to the postmodern Democrat party which takes the black vote for granted and thus does nothing to alleviate the curse of government dependency. And this dependency—where government replaces family—has destroyed the nuclear black family by rendering generations of black children fatherless. And if you believe that having a father is irrelevant to a child’s well-being then you are either stupid or a Democrat. It is vital to note that the Democrat Congressional black caucus have, along with their hero Barack Obama, been secret BFFs with the openly Jew-hating Louis Farrakhan, as recently published photos have revealed. 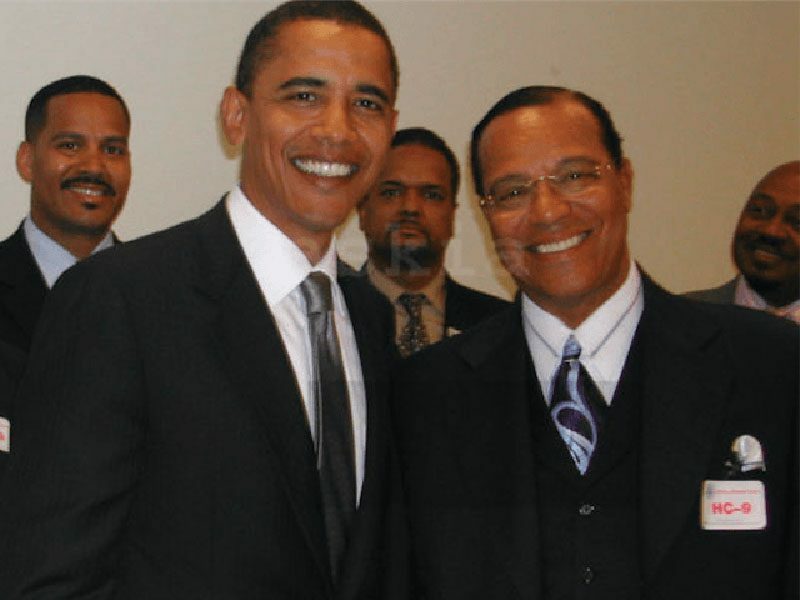 The secret photo of Obama and Nation of Islam leader Louis Farrakhan surfaces after a 13-year media cover-up. Imagine if a bunch of white Republican congressman embraced David Duke. The Democrat Congressional black caucus are a contemptible bunch of racists and anti-Semites. They have earned nothing but my contempt. That this behavior is tolerated in the Democrat party is an outrage. No wonder an IslamoNazi like Keith Ellison has risen to the such heights in the Democrat leadership. President Trump also reminds the world that his administration has finally done the right thing by recognizing that Jerusalem, the capital of Israel, is the capital of Israel. The Republicans leap to their feet and applause. This is the party that supports Israel. AIPAC ( a useless and toothless Jewish organization) will, no doubt, push the notion that support of Israel is a bi-partisan issue. But the polls tell a very different story. Republicans support Israel. The Democrat base has abandoned Israel in favor of the IslamoNazis. The Democrats glare at President with undisguised hatred at the Jerusalem line. They do not celebrate this common sense policy which strengthens our ties to Israel, America’s staunchest ally, and puts the IslamoNazis on notice that America will no longer bankroll their hatred of Jews and their hatred of America. President Trump’s Orthodox Jewish daughter Ivanka and her husband Jared Kushner. The secular Jews in the audience cringe because leftism is their real religion. They bitterly resent that President Trump has Jewish grandchildren — and they (most probably) do not. 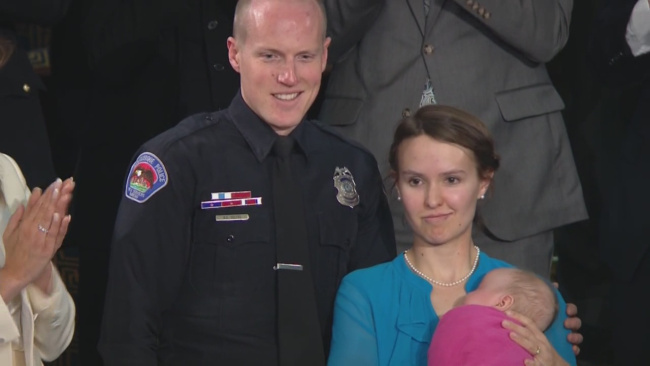 President Trump’s remarks about police officer Ryan Holets who, along with his wife Rebecca, adopted a baby girl from a woman addicted to heroin, brought tears to my eyes. President Trump’s line: “Americans are dreamers, too” was a much needed corrective to the Democratic rhetoric on DACA recipients. The Democrats have romanticized an entire group of non-citizens. President Trump does the Democrats one better by romanticizing all American citizens. Robert – you as a successful screenwriter probably know the power and meaning of phrases better than I – but I believe one of the reasons Trump earns such enmity among the Dems is that he turns so many of their catch phrases and words back at them. “Americans are Dreamers Too” is but one example. I read from Victor Davis Hanson today that among all of the candidates in the last Presidential election, only Trump was capable of beating Hillary. The Holets story was impressive. Just as good and visually spectacular was the last item, the NK defector holding up his home-made crutches. One interesting detail I have seen or heard no comments about came up at the end of his comments about the VA, where he suggested he’s looking for similar authority to remove dysfunctional staff from every agency, not just the VA. Sounds like a great idea to me, I wonder if it will go anywhere. Nov. 8 2016 was the 7th of Cheshvan, the day that Jews in Israel begin to doven for “regn”. Since Reagan wasn’t available, we got Trump, Baruch Hashem! Re the length of trump’s speech. All of these run longer than seven minutes, so I do not agree at all with that observation. It is not a movie. And everything Donald said needed to be said. And it was, clearly delivered, and beautifully written. So, let us rejoice. All clap hands. I didn’t watch the speech, myself, because I was convinced it would not be five minutes before a Democrat would scream “You lie!” and I didn’t want to put myself through that agita. But I will agree that the line “Americans are dreamers, too,” was the home run of the night. No president since Ronald Reagan, of blessed memory, could deliver such a line without being laughed out of the room. My worry is the power of the MSM to drive the national agenda. Something, I am sure, is going to happen over the next few days to dilute the power of that speech – a “Russia” squirrel, an “unexpected” shooting – SOMETHING to get people to remember that Trump’s America is a racist, compromised, evil place.